David Lamelas, Pico Boulevard west of Fairfax Avenue, Los Angeles, February-March 2010. Part of "How Many Billboards? Art in Stead" temporary project organized by the MAK Center for Art and Architecture. "Lamelas has continued to critique conventions of representation in his more recent projects, which foreground demonstrations of stardom and celebrity. 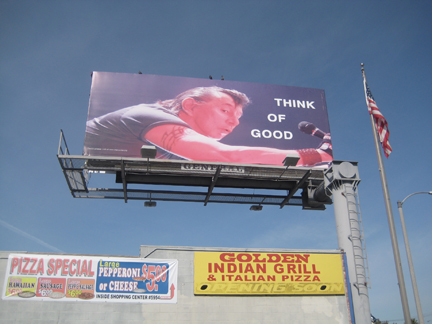 For How Many Billboards?, he takes aim at the archetypal rock star. Lamelas documents himself in the lead with hair slicked back and wearing a rolled-up black t-shirt revealing generic tribal tattoos. The electric pink hue of his face and exaggerated pose of his body leaning into the microphone add to the overall distortion of the image of an aging rock god. The phrase "Think of Good" hangs in the atmosphere like a mantra or refrain from a cliched song." - text from a longer description by Gloria Sutton, http://www.howmanybillboards.org/, accessed 03/2010.